TwitterJobSearch.com is a UK based Twitter based job search engine. Until now, search engines for social media sites merely looked for words. We’re looking at context. We use semantic tools to look at what was said. We then look at what they’ve said before. We then look at who was saying it. If we do this right, we can figure out why they’re saying anything at all. Although the service is based in the UK and still in Beta, a search for “Search Engine Marketing” yielded 5,831 results. 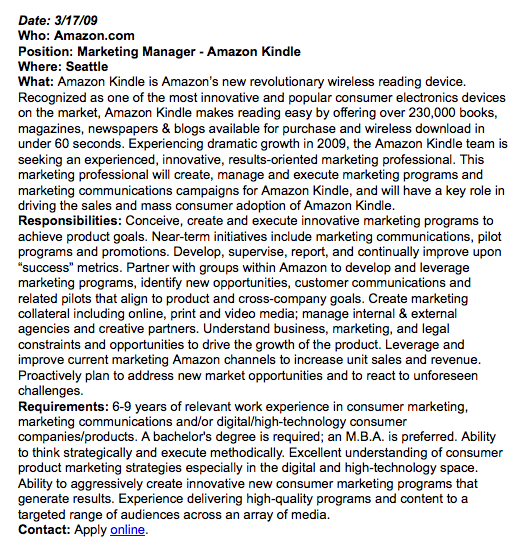 The same search also produced a Marketing Manager ad from Amazon.com for its Kindle product. Further proof even innovative new products just don’t sell themselves.